Bill C-71 has been introduced and the CSSA was there. We have had a chance to run through many of the provisions of this bill and the bill contains more pitfalls than initial examination makes apparent. Firstly, this is not a good bill for Canada's firearms owners. In fact, it stinks. Many of the provisions turn the future of firearms ownership from uphill to downhill. This bill is insidious, enabling traps and entanglements for future users. The following are some of our observations. They are by no means complete. Items will also be added as the tangles unravel. * Background checks for criminal violence and any mental illness will be conducted over the life of the individual, not the previous five year period. Most firearms owners are supportive of some form of mental health screening but the potential for abuse in this section may outweigh any benefits. Firstly, provisions that go back through the persons lifetime might be difficult for some of our honoured veterans, police officers and other emergency responders. The very nature of the work these heroes do entails exposure to terrible things that sometimes leave their mark. A firefighter suffering through the emotional trauma of a deceased family, a gruesome vehicle accident attended by police of the horrors of a soldier's combat experience may lead to times when one of these people may need the attentions of a health care professional. Others can experience bad things too and need help to deal with them. And then, the system springs into action to deny these people the opportunity to recreate with a firearms, to perhaps eliminate the cathartic healing of a day on a grouse hunt or spent in the deer woods. Worse, there is simply no evidence that this extended check has any positive benefit If it does, we await the evidence. * Both business and private sales of all firearms are subject to computerized license verification. Non-Restricted firearms transfers will not have the information regarding the firearm recorded. Is this a gun registry? No. It is a registry of active gun owners though. Of course, this presumes that all the verification and confirmations codes are recorded (and tracked?) Amazing quantities of data can be presumed through the recording of such data and of course, our trust in the system to perform the function benevolently is exactly ZERO. Since the massive debacle of the Chretien government the confidence of Canada's firearms community in the Liberal party and the RCMP drones is minimal at best. * Business are required to perform licence verification and keep records which will include the individual's information and all information regarding the firearm(s) transferred. The business must keep the records for twenty years unless the business ceases to be a business. In that case all records must be surrendered to the authorities. For the business end of this, this is a gun registry , pure and simple. It isn't a very good one but, anytime you force people to fill out a document that attaches a individual firearm to an individual person, that is a gun registry – and it includes long guns. Dealers must keep the records of the transaction for twenty years and if the business should go out of business, all records must be surrendered to the authorities. The Liberals state the information belongs to the dealer but the truth seems to be that the dealer is merely entrusted with its care-taking. * Authorizations to Transport have been gutted. The only permitted uses are to shooting ranges and Purchase-to-Home, but will still include "all ranges in province". All currently held ATTs will be revoked upon passage of Bill 71. Why? Why? Why? When bill C-42 became law, ATTs became valid for six common functions. Four of these have been eliminated despite the absence of any problems. Let's look at these six. 1. Still allowed: Transportation to any section 29 range in your province of residence, 24/7 . This the longest ranging one of the six. It means an individual can drive from Cornwall to Kenora - 22 hours non-stop - to shoot a match and drive home, staying in hotels, eating in restaurants, stopping for bio-breaks. 2. Still allowed: Bringing a firearms from the place of purchase (or post office) to your home . Truth is, this solves a way bigger problem for them than it solves for us. The authorities take a dim view of you unboxing a pistol at the post office so you can confirm the serial number matches your ATT before driving it home. 3. FORBIDDEN: Transportation to/from a gunsmith. This is despite the fact that the gunsmith must sign it in and out of their business inventory. This is not small. Un-maintained guns can be dangerous but it seems the government only cares about the safety of some Canadians 4. FORBIDDEN: Transportation to/from a gun store for the purposes of appraisal or sale. .Same deal, entry into the business inventory is undertaken by the business when in for sale or consignment 5. FORBIDDEN: Transportation to/from a border point. You better have your American documents and your Canadian documents or you are in for the worst two days of your life. 6. FORBIDDEN: Transportation to/from a gun show. Many gun show vendors attend a different show almost every weekend. It's bad enough when the CFO offices are so dysfunctional that they can't issue an ATT over a provincial border but, you can to any shooting range in your province but not a gun show around the corner to display your firearms. There is simply no excuse for these foolish restrictions except the pure contempt of the Liberal government and the firearms control bureaucracy towards Canada's firearms owners. Can you say Gun Bans? Well in fact, it is much worse than this. It sets the stage for many future gun bans. The creation of Section 12(9) is the creation of the federal firearms incinerator. You see 12(9) is different, unlike most of the other gun ban systems. In fact, it is most like Section 12(6.) Are you confused by all the Section 12 jargon. Let us make it simple. Section 12(2) – Full Autos. Section 12(3) – Full autos converted to Semi-autos. 12(4) Firearms contained in Prohibited Weapons Order 12. Section 12(5) – Firearms contained in Prohibited Weapons Order 13. 12(6) – Handguns with barrels of 105 mm or less, .25 and .32 calibre. 12(7) – 12(6) handguns manufactured before 1946 and registered as family heirlooms. 12(8 ) – The regulations governing these prohibited firearms. 12(9) – CZ-858s and Swiss Arms Classic series rifles... FOR NOW! What 12(9) really is about, is a wide open gun ban window. Any firearm, rifle, pistol, shotgun, BB gun, can be tossed into the black hole of 12(9) at the Order-in-Council whim of the feds, whenever they choose. The ban is semi-deferred and owners will still get to shoot their guns, for now, and at the discretion of the Chief Firearms Office. It is slow boiling of the frog and the perfect vehicle to effect massive firearms bans, of any gun they choose, at any point in time that suits their agenda. * The powers of the Governing Council to declare any firearm to be Non-Restricted has been revoked. And if you thought the last point was bad, check this one out. The Trudeau government wants to make the RCMP the ultimate arbiter of all things good and just. They are removing the only brake the RCMP has on their ultimate authority to ban the lawfully owned property of Canadians. The ability of the ELECTED government of Canada to reverse the stupid decisions that have routinely emanated from the incompetence of the RCMP firearms lab. Let's look at the two affected guns, the CZ-858 and the Swiss Arms Classics. The RCMP gave these very firearms a non-restricted rating. A decade later, after thousands had been sold, the RCMP says, “Whoopsie, we were wrong – they're prohibs – turn them in.” Minister Steven Blaney says, “You can't do that to people” and puts the power in place to reverse a stupid, politically motivated decision. 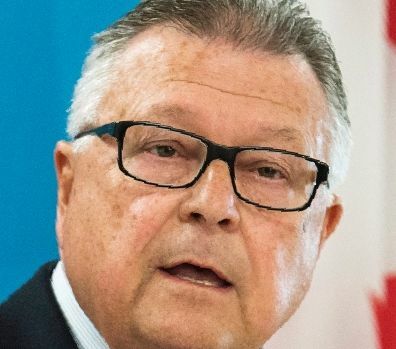 Now, in a move destined to be one of the stupidest decisions this Liberal government has made yet (and that says a mouthful) the power to correct the mistakes of the RCMP has been repealed. Un-elected – All-powerful – Un-accountable. There's still more to come in this bill. The UN Firearms Marking System is still to come in the form of a Technical Amendment. We are not hopeful for a successful outcome. Let's be blunt, after Bill C-71 the Liberals have shown that their spots have not changed. They continue to hate us and along with their dishonest partners, the majority of Canada's mainstream media, will continue their unprovoked attacks against 2.1 million lawful, trustworthy, licensed Canadians. After all this, this legislation ONLY affects lawful gun owners! Surprised? Be part of the solution - Join the CSSA today.